Please remember, even if it's only traffic court, you should at least appear to be taking things seriously. The Queensland Times reported recently that a 27-year-old woman irked a local magistrate with her response to his questions about her driving offense. Asked if she had any reasons for driving without a license, she replied, "I'm a full-time student, single mother, and … yadda yadda yadda." As you may recall, the phrase "yada yada yada" became famous in a 1997 Seinfeld episode, "The Yada Yada," in which George's girlfriend perplexes him with it. (I assume "yadda" with two Ds is the Australian spelling.) It means, more or less, "and so on," with the sense that there are a bunch of minor details the speaker doesn't really want to get into. According to this item on The Straight Dope, the term can actually be traced back at least to Lenny Bruce in the 1960s, and probably derived from variants like "yaddega yaddega yaddega" or "yatata yatata yatata," which the author claims were used by vaudeville comics in the 1940s. 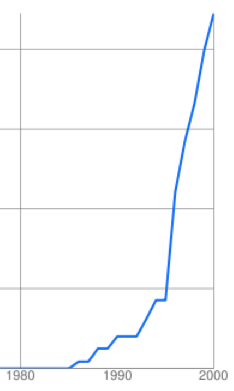 Use of the term skyrocketed, though, after the Seinfeld episode aired, as you can see from this graph (which I made with a Google app and yada yada yada). But don't use it in court. The magistrate didn't sanction the woman for her attitude, but told her he wouldn't "accept her babble" as a reason for her actions. She then said she had just forgotten to renew her license when it expired (a few months before). She was fined $120. The report also says that a 35-year-old man was "sent to the watch house" last year for repeatedly calling another magistrate "mate" rather than "Your Honor."